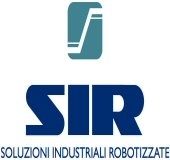 SIR was established in 1984 when its founder, Luciano Passoni, got the idea of joining three branches of the same corporation in a single company that already had ten years of valuable experience in its background. An electronics company, a mechanical company and an important technical design office thus joined forces to become an engineering firm engaged in the business of developing robotics and automation for the industrial sector. SIR is specialized in study of situations and problems of companies in the widest possible range of market sectors, where it establishes a relationship of effective cooperation in order to obtain the most advantageous solutions in terms of flexibility, performance and investment. SIR designs complete plants down to the smallest detail, sharing the solutions applied with the client, and constructs and installs all the equipment on its own premises where the client can test it fully to verify the performance. We have a technical office for mechanics and electronics with over 40 regular employees just for engineering. They work with 2D and 3D CAD stations and off-line programming and can successfully handle the most complex demands of the market in terms of flexible automation. 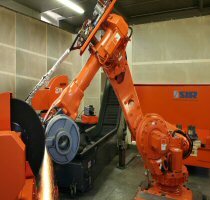 Machine tool sector: in this sector SIR has considerable experience in service of any type of machine tool, and disposes of vast competence in the necessary hardware and software for interfacing. 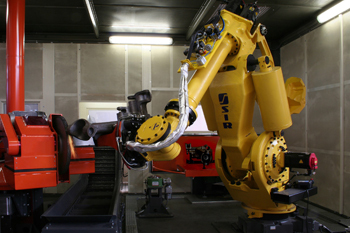 Assembly: SIR can design and develop complete assembly lines with flexible robotics. Foundry sector – aluminum, cast iron, steel: core manipulation, core assembly, deburring, cutting, riser removal, gravity and low pressure pouring, emery grinding and polishing. In all aspects of foundry operation, SIR performs many applications with important references in the sector. Information Technology: SIR has its own research and development laboratory where it analyzes and develops the most sophisticated systems of vision, supervision, interfacing of automation with data processing centers and production control in the client’s company.